Home» android tips» tips and tricks» How to Lock apps on iphone/ipad without Jailbreaking? Mobile phones have become integral part of our life & with the passage of time, we are relying on mobile phones having operating systems like Android, IOS for Iphone/Ipad etc. We have almost got all of our important data in Mobile phones, so it become necessary for us to enhance the protection of Iphone or Ipad so that our data could remain secure. We will be discussing a widely searched question that How to lock apps on Iphone or Ipad without jailbreaking? We have previously discuss what does jailbreaking mean. Our focus in this article will be to sort out the best possible ways by adopting them to lock any app like Facebook, Whatsapp, Twitter, etc on Iphone or Ipad. How to Lock apps on Iphone/Ipad? For locking your personal apps under a strong password, first you should download iAppLock app. The User Interface designed for iapplock is simple, dynamic, fluid, & User Friendly. After the installation of the app on your Iphone, you will see a window that will have a title as Protected Apps. 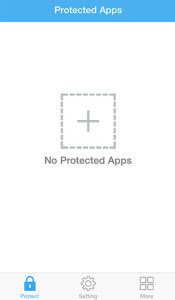 If you have not added any app in protected list, then that list will be empty. There will be a Dialog button with Plus (+) sign. 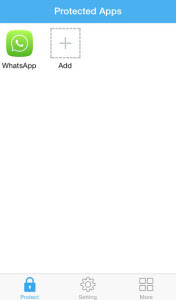 After tapping on the + Sign, it will show a list of all the apps installed on your Iphone. You will have to select those apps which you want to lock under the password so that no nobody else could be able to access them without applying the correct password pattern. After you have selected the app in the protected list, it will ask you to add the password that you want for that app. 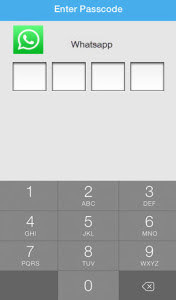 You can select either alpha or numeric password but both at a same time are not available in the current version of iapplock. Now your app has been protected under the password. Any body who want to access that app will have to apply the correct password. Failure to do so will not result in opening of that app. 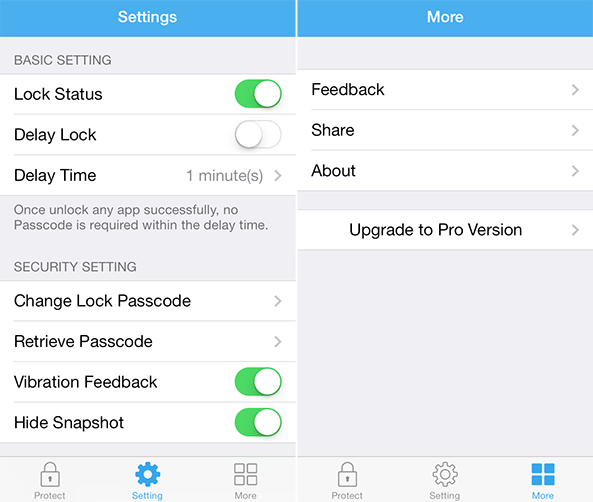 If you go into settings tab, you will see that iApplock app also provide some additional custom settings. You can perform numerous settings like if you unlock any specific app, then all the other apps will be unlocked for the specific time duration that has been set by you. You can set delay of 1min, 5, 10, or 20 minutes, etc depending on the requirement. You can also change the password. 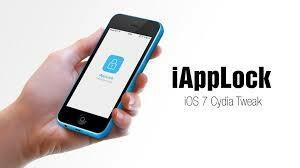 It is an easy & quite comfortable way to lock apps on Iphone. By locking your important apps under a strong password, unauthorized access to your Iphone will be block. No body will be able to access any of your important document, text messages, contacts, call logs, images, videos, etc. It is the best way to keep your phone away from the praying eyes. Often your friends ask you for your mobile for some task like they have to make a call. Meanwhile, if they start staring at your personal texts messages or going through call log, then that is not the right way. Locking apps will prevent them from opening any of important files or document in your phone. With the advancement in technology, mobile phone hacking is becoming common & it is becoming the major issue now a days. If you have locked your phone, then that mean you have took the control of your phone in your hands. You have not allowed any body to remotely take the control of your data. It will become quite difficult for hacker to access your phone if your iphone/Ipad is locked under a strong password. 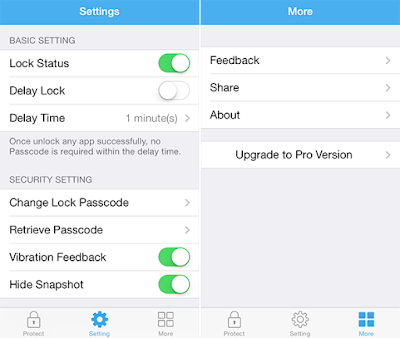 You can enhance your phone security by locking apps on Iphone/Ipad. How to stop Someone from spying on my Phone? How to fixed remotely hacked Iphone 6? Can someone hack my phone by texting me?